Here at Topp we’ve been working on several projects with wearables, most notably as design partner to Samsung, collaborating on the core experience of the Gear S2. 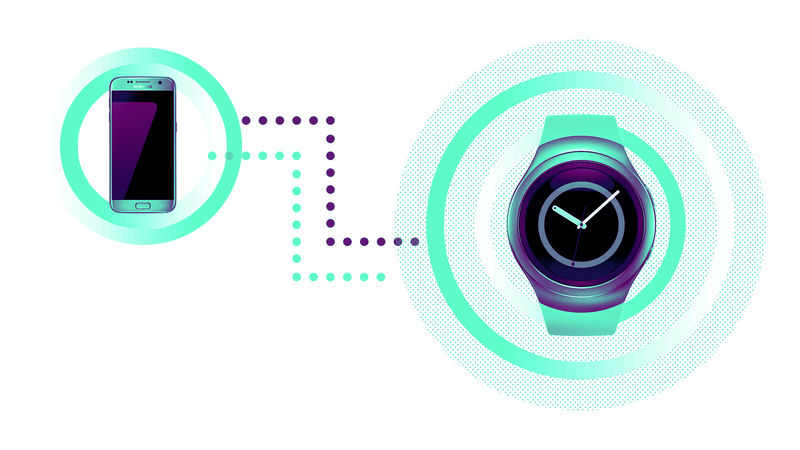 Working with the foundation and building blocks of a product like this has challenged some of our assumptions around smartwatches and in this blog post we will share a few of these insights. Smartwatches today are mainly companion devices. This is to a certain degree due to technical limitations but the Gear S2 has 3G connectivity (likely something the competition will also catch up to) and this if of course a huge step towards being a true stand alone device. 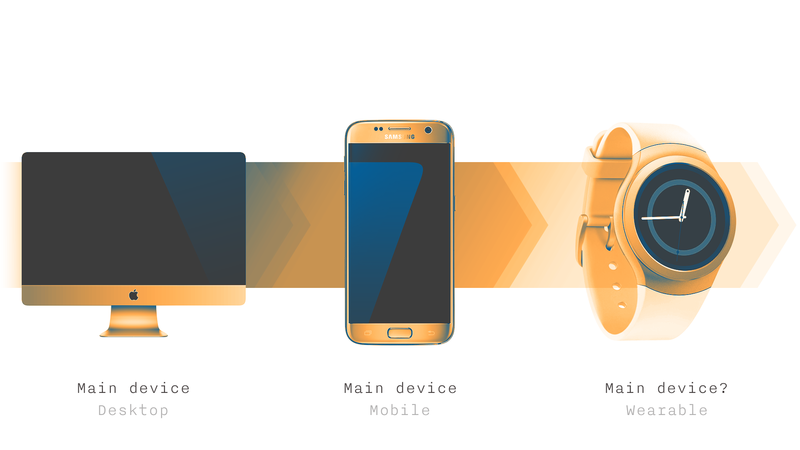 So when it is technically possible, will the smartwatch be able to overtake the role as your primary device? Being used to designing for larger screens you get a bit scared when you realise just how small a 1,5 inch screen can feel. Instinctively you want to kill of features and functionality in order to create at least a bit more room for your interface to breathe. Being really strict with what features you put in is of course in many ways a good thing - you get a very clear and intuitive experience focused on the stuff that matters. If we take Android Wear as an example it is clear that this approach has been central and even though more features are being added, the functionality is still very bare-bones and the aim is clearly companion devices. Working with several wearables we have however noticed that we seem to be underestimating their capabilities and this in turn creates preconceptions that limits us as designers. If we go back about ten years we find a very relevant example in the mobile web. Surfing the web on your mobile phone was mainly seen as a joke. With the hardware being used at the time this was probably a justified standpoint. Then out of nowhere came the iPhone and introduced touch screens that where several steps ahead of the competition. Along with this also came new interactions like pinch to zoom and all of the sudden the web on your mobile phone was kind of alright. Fast forward to today and it can be argued that the mobile web give users a better experience than desktop. So what can we learn from this? First off, it teaches us not to underestimate technology based on what we think we know. Secondly, it shows us what importance hardware can have to change our perceptions of what is possible and not. The rotary bezel of the Gear S2 is a hardware innovation that has really expanded our perspective. As an input mechanism the bezel allows you to traverse large distances in a very natural and convenient way. In turn this unlocks a lot of new possibilities because suddenly the small 1,5 inch room feels so much bigger, and this space can be used for features taking the product beyond just being a companion. A definite show stopper for people today to only use a wearable and ditch the phone is definitely the camera, or lack there of. If you told someone fifteen years ago that they in 2015 would be able to take pictures on par with a system camera and shoot 4K video with their phone they would probably not believe you and they wouldn’t even know what 4K is. The camera capabilities of wearables today are far from this, but what is to say that you in five years won’t be able to snap pictures from your wrist with a better quality than those from the best Smartphone cameras of 2015? Imagine the convenience of being able to instantly take pictures of good quality without having to dig through tight pockets, squeezing out that gigantic phablet. Yes you can say that ”photography is all about the optics” and will never work on a small device, however looking back this is likely exactly what people were saying about a good camera on a phone. Ok, so new input methods and hardware can create space for richer experiences and we will hopefully get smartwatches with great cameras. What about watching Netflix or editing a spreadsheet on the bus? This is likely not very engaging or effective on a round 1,5 inch screen. Well maybe you have an extra device with a bigger screen with you or your wearable can project content to a lens on your eye. Yes, but let’s disregard options like that for now and assume that the smartwatch is your only device. Again if we go back in time, we have to remember a new device paradigm rarely comes without trade-offs. When we traded our dumb phones for smart ones we accepted an unbelievable decrease in battery life, simply because the smartphones had so much other good stuff going on. If we can create smartwatches that take full advantage of the form factor to create new value it is not hard to see that you might think it’s ok to trade Netflix for a podcast or some other form of pastime while you’re on the bus. The same can be said about texting, if smartwatches get really good you might think it is ok to make some phone calls or use speech to text instead, or for that matter some entirely new form of communication - designed specifically for wearables. CAN THE SMARTWATCH STAND ALONE? 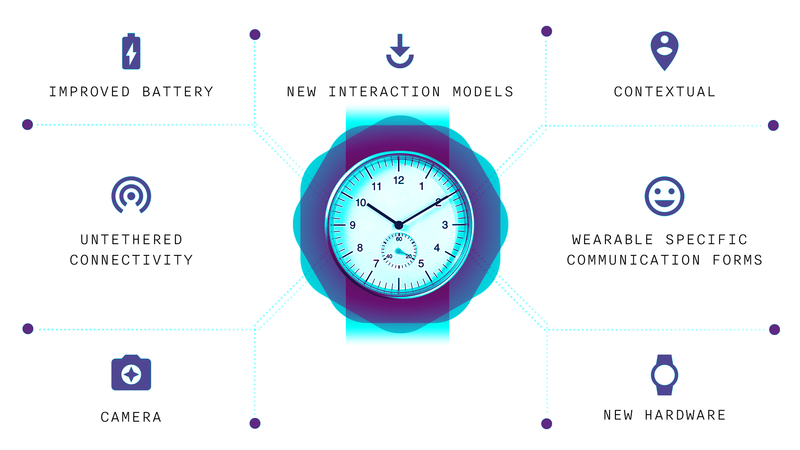 We think smartwatches definitely can take the role as a primary device. However, for this to happen it is important that designers craft experiences that fully utilises the form factor and in that way creates unique user value. In order to achieve this, it is important that we constantly think beyond current paradigms and challenge our assumptions. Even if smartwatches grow out of being companion devices, it is still quite likely that they won’t be completely alone, certainly this is not what the hardware manufacturers would prefer. This raises some very interesting questions around the other devices. If the smartwatch is your main device and what you show off with, will other devices for consumption and creation be considered more or less extra screens and turn into something equivalent to a desktop monitor? If all your personal information and content is tied to the watch, can you use any screen? We look forward to exploring these questions and more as we move on to more intimate devices that serve as an extension to the user rather than her phone. Let's talk about the future of design.